Elk Grove Village, Illinois — Wittek Golf, a subsidiary of P&W Golf Supply, is introducing the all-new Eagle Lite picker at this week’s 2018 PGA Merchandise Show in Orlando. Part of the Pro Line Series, Eagle Lite is the lightest, most durable picker in golf. 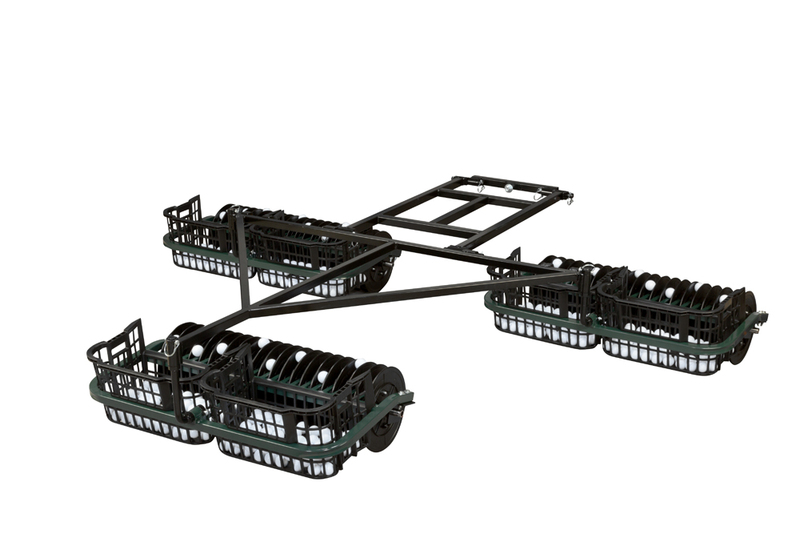 It places less pressure and drag on the cart, which translates to greater maneuverability, faster ball picking and valuable time savings. The bearing-free Eagle Light ($1,999.99) is 9’ wide and holds 1,800 balls. It comes complete with a push bar and mounting bracket, 1 1/4” powder coated steel framework, plastic baskets, nylon discs, solid steel posts that help maintain level basket heights, and adjustable axle brackets. Optional durable, white nylon discs are ideal for ranges using soft-covered balls, as they will not scuff the finish off of the balls. Other upgrade options include a 5 gang that’s 15’ wide and holds 3,000 balls, as well as a front wheel package for more maneuverability. Wittek Golf will showcase the Eagle Lite in booth 2443 on the PGA Merchandise Show Floor. Since 1946 Wittek Golf has been the first choice of golf professionals, superintendents, and golf industry buyers. Under our P&W Golf Supply umbrella, Wittek Golf and its sibling Eagle One is the world leader in golf range pickers, washers, dispensers, flags, signs and almost every other golf course/range product. When it comes to golf supplies, we are the golf supply specialists. Our vision of being the “One Stop Source” for golf facilities — coupled with a belief in total customer satisfaction — has maintained us as the leader in the industry. As the world’s leading range equipment manufacturer, P&W Golf Supply strives to produce innovative products that meet customers’ evolving needs, and at the same time, provide unsurpassed service which is fast, friendly, and efficient.